Light, shiny, seductively scented lip gloss is a success among all without exception. Young girls and older ladies are willing to use it. Lip gloss won unconditional popularity worldwide, and not without reason. The fact is that lip gloss performs several important tasks. It gives lip color, which is lighter and less durable than you can get using a lipstick. However, it also noticeably changes the look of the lips, making them look voluminous and well-groomed. It can help create the very interesting, attractive and stylish effect of "kissed" lips. In addition, the lip gloss takes care of the delicate and sensitive skin on the lips, nourishing and moisturizing them. Today the choice of lip gloss is huge; various companies, well-known and not very popular, offer products for every taste and budget. As a rule, modern lip gloss features a comfortable brush, with which it can be quickly and easily applied to the lips. It does not require any special skills, and even the most inexperienced girl is able to use it. There is also lip gloss available in the form of a stick or conventional tubes. Lip gloss can be transparent and translucent, and can include shiny particles and sequins. You can apply a lip gloss over a lipstick, or it can be used separately. 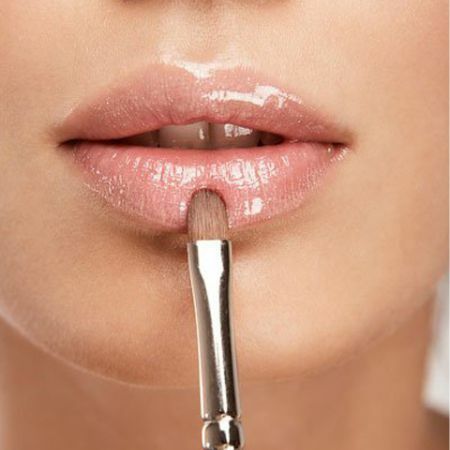 If you do not have time to create a full makeup look, lip gloss becomes a "magic wand". For a couple of seconds, it will give perfection to your makeup and will make you more attractive. About 25 to 30 years ago, no one ever heard about lip gloss in our country! This is hard to imagine. In that distant time, the choice of makeup was small. Women only had to use lipstick, and it was not of the best quality. But when lip gloss appeared on the market, it immediately won the hearts of our dear ladies. Today lip gloss is still a trend, and that means something. Lip gloss is clearly not superfluous in any beautician. This is an extremely useful product. See for yourself—use it at least once. The main thing is to choose a lip gloss of the right shade. Use a lip gloss, be compelling, and shine! Lipstick was known from ancient times. It was popular in Ancient Greece and Rome. At the same time lip gloss appeared not so long ago. It became popular in the second half of the last century. However it has already become very famous and now it is inevitable part of women’s make-up. It can be hardly called an outsider among all available cosmetics. Such a high level of popularity can be due to the fact that apart from ordinary lipstick gloss helps to keep the natural color of your lips. At the same time it makes it possible to hide inevitable consequences of the aging process. Lip gloss can stress advantages of your appearance and attract attention to them. However it is very important to choose the lip gloss correctly. Lip gloss contains minimum of dyes. It is mainly based on different kinds of oils. It creates a slight colored background together with moisturizing effect. Sometimes shine grains are also added to a lip gloss in order to create a purple effect. The package can be also different. You are able to choose among different brushes, tubes and other kinds of packages. Lip Gloss why is it needed? If the package has no difference to you should pay attention to components and ingredient that product contains. What moisturizing substances have been added? Is a product a fake? If you feel any other substances which are not mentioned on the package, it means that you are not supposed to use it. It will not be able to cover all the surface of your lips accurately. Thus may result in lumps. You should choose a color that will stress advantages of your appearance instead of its drawbacks. In case you have pump lips, you are not supposed to use intensive colors. They will only stress the shape of your lips and even make them bigger. Imagine that you managed to purchase a product that suits all your tastes and is able to stress your beauty. No you are supposed to learn how to use it properly. If you do not have such experience, you should do it this way: you will need a pencil and encircle lip contour. This will help you to determine the right volume for the lip gloss. In case you want to keep the gloss as long as possible, you can also use powder for your lips. The full set of actions includes accurate encircling of lip contour, covering your lips with a layer of lipstick and powder. As soon as you are finished with that it is high time to put another layer of lipstick and finish it with lip gloss. In case you feel discomfort, you should remove all the layers with the help of wet napkin. In case you do not have any of these necessary things including a pencil or a lipstick, all you need is to moisturize the center of your lower lip with the help of lip gloss. Then you should move your lips from left to right and keep them tight for a couple of moments. You’d better stick to one very important rule which says that make-up should be appropriate to a particular situation. In case you only need to refresh it during your working day, you will only need several touches of lip gloss in order to stress the tone. At the same time if you are preparing for a party or going to the theater, you should not be afraid to make experiments. You can feel free to use bright lipstick that will stress the shape of your lips and will be perfectly combined with lip gloss. In case you have already managed to find your style according to your taste, you will not find it difficult to use lip gloss properly. If not, it is never late for learning. Like the article «Lip Gloss»? Share it with friends!